Our Delta Superior - 40ft x 14ft, is arguably the best located private plot on Waterside. 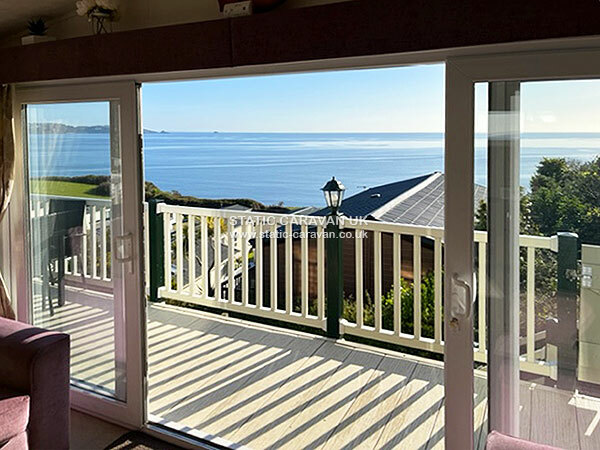 The wonderful panoramic coastal views will take your breath away. ♥ Seven Reasons to Choose Ocean View for your Holiday. ♥ New Delta Superior Luxury Lodge: Overview. Ocean View is a 2014 Platinum Grade, Delta Superior Lodge. Our lodge is 40ft x14ft. It is located on an elevated terraced with its own private approach pathway and steps. 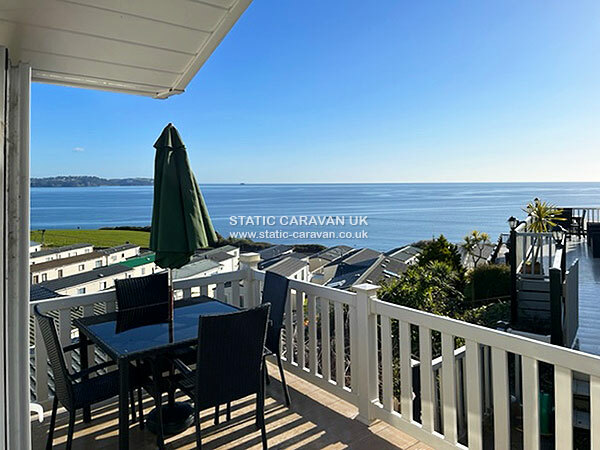 Enjoy breath taking coastal sea views of the beautiful Devon English Riviera coastline. You will not want to leave this holiday home at the end of your stay! Ocean View is fully furnished and fully equipped to a very high standard. 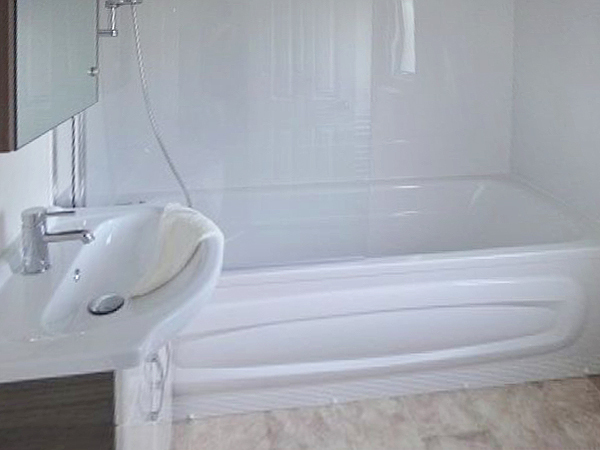 Guests can enjoy the full benefits of double glazing, gas central heating, fully equipped modern styled kitchen, en-suite bedroom, bathroom with full bath & shower, and to be quite honest, pure luxury where ever you look. 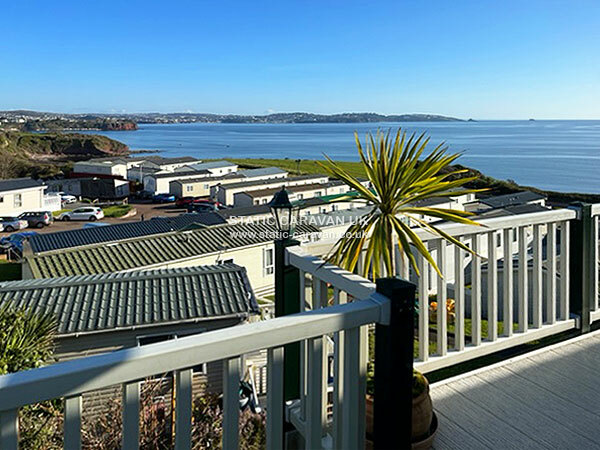 You will not find a better sited Platinum Grade holiday home on Waterside which enjoys the same panoramic coastal sea views as our holiday home. Our Photographs show the actual views taken from our holiday homes location. What you see is what you get! Please visit the Ocean View website for more information. We are not the cheapest on Waterside but we are one of the best! 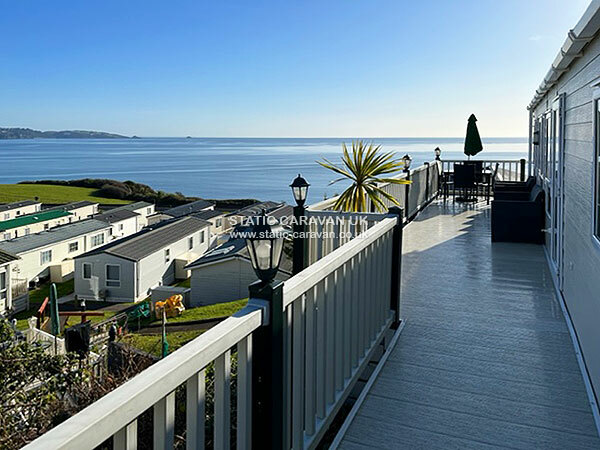 Ocean View has a custom-built raised non slip decking area so that you can take full advantage of our fantastic and unique coastal views! Our elevated deck is THE place to chill out and relax from the strains of to-days modern living. We have patio seating for six, along with a table and sun parasol. 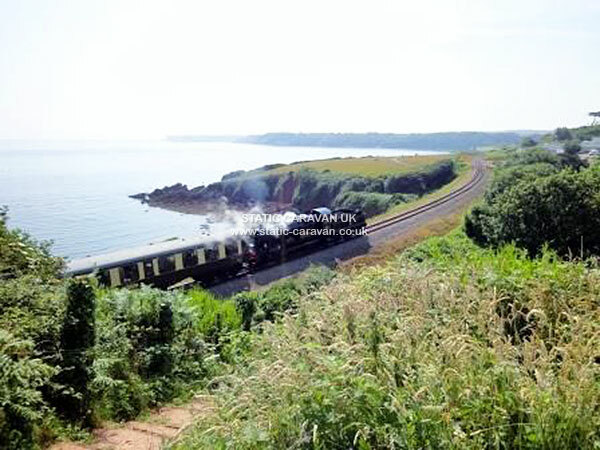 Enjoy the spectacular sea views, the passing steam train, and take in the fresh sea air. Maybe you just want to relax with a good book and a glass of wine and let the world sail by! Due to our holiday home’s unique location, our guests can enjoy peace and quiet at all times. Fact: A lot of our past guests re-book with us each season. Our platinum grade open plan spacious living area, comes complete with luxurious free standing furniture which include a three seater sofa bed, two comfy arm chairs and full sized sliding French patio doors which allow you to enjoy uninterrupted amazing sea views. The spacious open plan lounge area has sea views from all windows. Further enhancements include a 32” wall mounted flat screen TV with Freeview and DVD player. The quality theme of our five star grade living is also reflected in our stylish designed kitchen and dining areas, which include LED lighting. The matching modern colour scheme using ivory gloss doors and natural colours give a quality feel to the functional kitchen area. Further luxury enhancements that give Ocean View the edge over all our competitors include: American fridge freezer with built in ice maker, washer/dryer, dishwasher, built in microwave and cooker hood. The dining area has a modern contemporary dining table and four chairs. Ocean View master bedroom; has a double sized bed topped in memory foam, bedside tables, mirror and full bay windows. Leading off the master is an en-suite bathroom with shower, toilet and hand basin .There is also a separate large walk in wardrobe. The second bedroom is a good sized unique L-shaped twin bedroom with twin beds, storage, and enjoys sea views. In addition we also have a sofa which turns into a double bed in the lounge area which sleeps a further two guests. 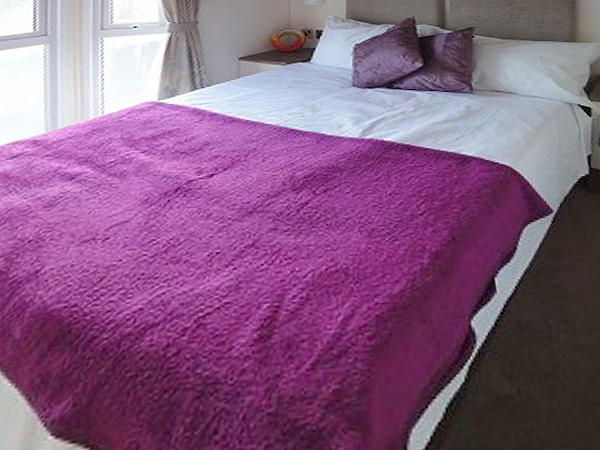 We can sleep up to six persons in well-appointed plush surroundings. Ocean View has a mains supply for electricity, gas and water. For those chillier nights there is the added benefit of full gas central heating. We supply an inventory of bedding for up to six persons to include quilts and pillows. Please supply your own bed linen, towels and toiletries. Do not forget to bring your binoculars! Please note that our lodge is not suitable for wheelchair users due to the steps which lead up to our home from the parking area. We personally clean & manage our lodge to professional standards. 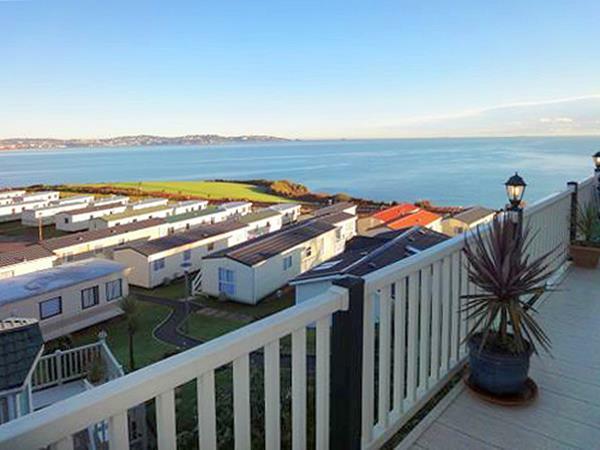 Please note that we also own five further Holiday Homes on Waterside. 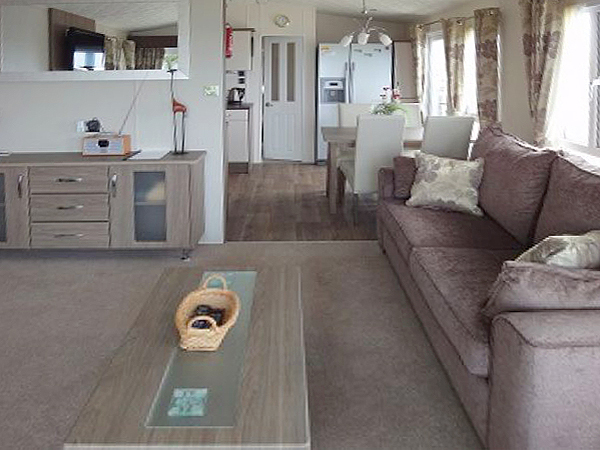 All of the Caravans/Lodge are Platinum Grade models. 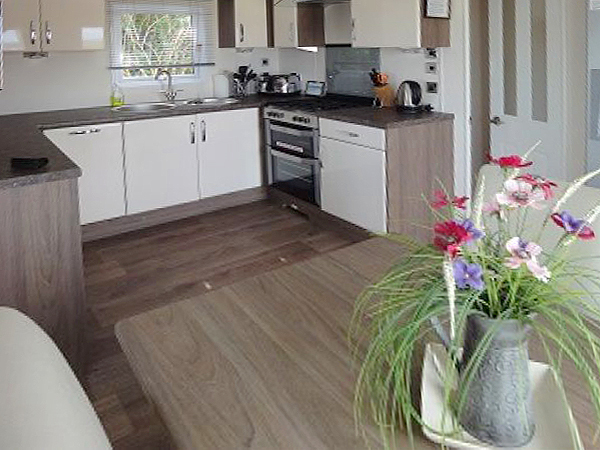 All five units are located on a level choice plots with decking access and with the same fantastic coastal views. 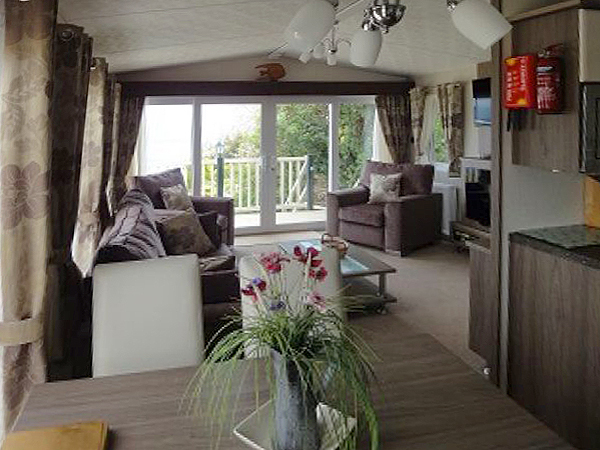 It is now possible to double or triple book our holiday homes for larger family groups. 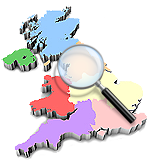 Please visit our websites which can be found on this Static Caravan site, for full details on price and availability. We do NOT include entertainment passes for guests. Passes can be purchased at an extra fee at reception on arrival. Nightly entertainment shows run from April to October each season. 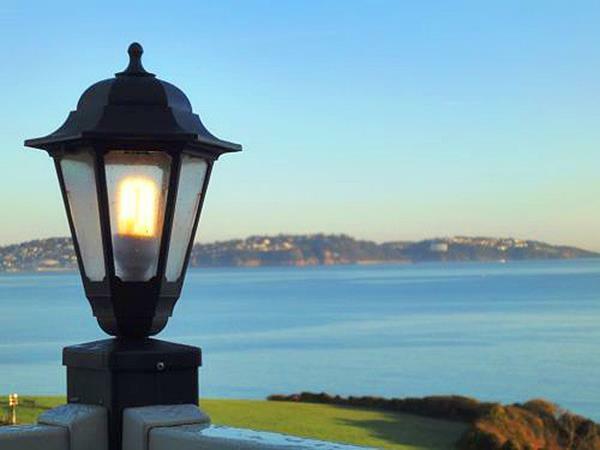 Set in a tranquil valley, with stunning coastal views a plenty, the clear blue sea and mild climate offer exactly what you’d expect from the delightful English Riviera. Providing family friendly opening times to splash about with the kids or simply soak up some sun. And there’s always the Kid’s Club to keep your little ones entertained. If it’s a beach location or tranquil country destination you’re looking for, Waterside Holiday Park has it all. ♥ Booking deposit is calculated at 20% of total rental cost. ♥ Final balance payable two months before your holiday arrival date. ♥ We accept payment by: Cheque, P.O. Order, Bank Transfer & PayPal. ♥ A fully refundable £75 security deposit will apply to all bookings. ♥ We personally clean & manage our home to professional standards. That’s not the only reason to spend a holiday or short break at Waterside. The entertainment venue is one of our finest with plenty of room to take in the live shows – you can enjoy a different show every night of the week at Waterside. The wonderful views come courtesy of a hillside location so its not ideal for anyone who struggles with slopes!